“There’s no place like home” That sentiment, written on my sign at Monday night’s game when the Rockets beat the Wizards for their eighth consecutive win at home, is how I’ve felt lately as a Red Rowdy. That sentiment, written on my sign at Monday night’s game when the Rockets beat the Wizards for their eighth consecutive win at home, is how I’ve felt lately as a Red Rowdy. They call me Rocketgirl. You may have seen me before. 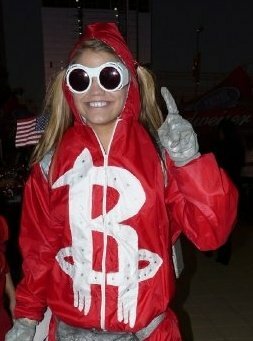 I wear a Rockets red spacesuit, white goggle glasses, a jet pack and a few other space-like accessories to all of the Rockets games. Every once in awhile I’ll change it up like I did last night with my blue, checkered “Dorothy” dress and glittery red shoes with Rockets logos. This season, my third as a Red Rowdy, Clutch has given me the opportunity to share my experiences with you. I have had some unbelievable experiences and I am looking forward to sharing my stories with you on this blog. I was really impressed with the crowd Monday night. I don’t know if it was the lure of the RPD swimsuit calendar, the fact that people were off work and out of school for Christmas vacation or that fans were excited about our team approaching the .500 mark, but there was nearly a full house and fans were into it. As a Red Rowdy, the best feeling is when the rest of the Toyota Center does what you’ve been doing the whole game: stand, chant, and cheer. I even get chills. During those times, I pause, just for a second, so I can watch and listen to the rest of the crowd chanting in unison. In the fourth quarter, two of my fellow Rowdies – REDiculous and Rowdy South Park Satan – held signs reading “get up” and “on your feet” and were able to get sections 113 and 114 standing. With those sections on their feet and cheering like crazy behind the goal, the Wizards went one for four at the free-throw line, including a pair of misses by John Wall with fans chanting “Brick Wall.” That’s when you feel like you make a difference. After the game, I got a chance to talk to the real Wizard, Daryl Morey. He was roaming the concourse late after the game and a few of us went to talk to him, including a couple of Rowdies who were with me in the Free Agency Caravan. We talked and joked about the caravan and the game. He referred to me as Rocketgirl, which was pretty cool, although it’s probably because I Tweet to him frequently. We stood their basking in his presence for a while until it got awkward. I am probably biased, but the Rowdies have been looking and sounding strong, especially during this eight-game home winning streak. During the past few games, we’ve been allowed to bring guests with us doubling our section and helping tremendously. There are copycat NBA fan groups that have double the amount of seats we do. Having almost twice as many people and voices has been great, but no guests tonight as the house will be full for the Heat. For the first time since I have been a Red Rowdy, I’ll be representing the Rowdies and watching the game from a different location, near the Heat bench with a friend I met on Clutchfans. I’ll be doing my best to heckle the Heat to help the Rockets get their sixth straight win and ninth straight win at home!